I decided with the coming of the New Year of 2015 it was about high time to return to a location in Westmoreland County! Many of you are probably in agreement. 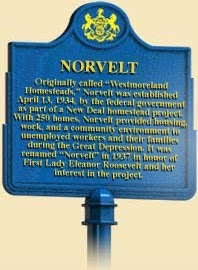 "Originally called "Westmoreland Homesteads", Norvelt was established April 13, 1934, by the federal government as part of a New Deal homestead project and relief measure. With 250 homes, Norvelt provided housing work, and a community environment to unemployed workers and their families during the Great Depression. It was renamed "Norvelt" in 1937 in honor of First Lady Eleanor Roosevelt and her interest in the project." Surprisingly, there was political opposition from the Democrats and to a certain extent, the President himself, who eventually gave in to the First Lady's scheme. This place's creation will of been as a part of the NIRA project for subsistence. This was the fourth such implemented in the era of the start of big government involvement with a $25 million congressional allowance. The visitatio there of Eleanor Roosevelt occurred on May 21, 1937 and the wife of the Secretary of the Treasury when the residents agreed to name the community after her, (EleaNOR RooseVELT). 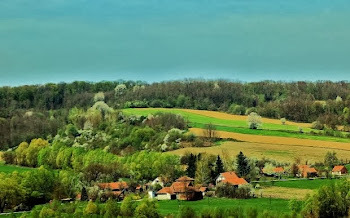 Eventually residents managed to purchase their homes and the property. The socialist outcomes of the project is debatable as those that gained by it soon took up jobs away from the government farms for the private sector, but the immediate relief was a sure success. Sections 'A' and 'B' are divided by the Mount Pleasant Road on Rt. 981 and is served by Sewickley Creek and the SW PA Railroad. Calumet was founded by the Calumet Coke Company, (1888-1932), with 260 bee-hive coke ovens and had experienced a difficult miner strike in 1894 against the part owner, H. C. Frick. Supposedly continuing into the 1950's in one from or another. The H & R Tool and Die Co. housed the Union Supply Store. A man from Greensburg, PA, by the name of Colonel Moore, acquired near 2,000 acres of property here in the Laurel Highlands, back in 1879 for the purpose of establishing a mining complex which used the Sewickley branch of the Pennsylvania Railroad. It was soon to be sold to the super industrialist Henry Clay Frick who was born on a farm and distillery in West Overton that also had mining and coke operations of its own. Soon this was the scene of appalling terror and tragedy. An explosion of truly 'Mammoth' proportions, (at the No. 1 mine), took place in Mount Pleasant Township on an early morning at 9 a. m. on January 27, 1891 and was one of the worst disasters of this type known. As stated in an article of the times, It was, "a disaster with scarcely a parallel in the history of this county", (Westmoreland to be exact). This was a such a blow to the H. C. Frick Company, and the hardened but awe-struck managers certainly. Although the managers were, perhaps conveniently, found by the state inspector not to be at fault. Some of the bodies were practically incinerated. The Mammoth Mines and Coke Works No. 1 and No. 2 were located out past Rt. 982 north of Kecksburg. This is south of Latrobe and 5 miles or so to the northeast of Mount Pleasant, west of Poker Road. It contained over 500 ovens. A part of the larger Connellsville Coke region. Though the recent report that the mine was safe by the fire boss, his life was claimed as well in this mind numbing methane gas explosion that ripped through the dank underground tunnels. The Pit Boss by the name of Eaton, and the Superintendent Fred Keighly who was transferred from the Hill Farm Mine disaster, were hard pressed to deal with the after damp and deathly black vaporous smoke! They worked as quickly as could be managed under the circumstances to remove the bodies before the Flat no. 's would become flooded by damaged pumps. 107 men, over thirty with families, and some boys lost their lives here, with others also injured, leaving the wives, children and parents to mourn the loss. The unbelievable horror was supposedly begun by a miner's oil lamp. This did have the effect of leading to legislation for better mining condition reforms and safety inspections that could be trusted. The state committee selected to investigate the tragedy wrote of the safety mine law, that is was "very defective and ambiguous and needs revision and extension..." This eventually took on added significance, as these things often do, and the tragic events surrounding such tragedies, as the near in time, Morewood mining massacre, and yet to come Darr mining disaster, the worst ever in the state, have finally received dedications partly through the influence of the Pennsylvania Labor History Society. With the usage of proper historic markers, proper respectful ceremonies performed and plaques to the memory, more than might be expected of war dead. In those days many of them were quickly buried without much notice southeast of Scottdale at the St. John's Catholic cemetery in a mass grave. As to a Tribune-Review article by Marsha Forys of September 28 on the turn of the millennium, "This action gives us an appreciation of our history, our past, our tradition. Unfortunately, we don't always value those things, but it's good that we're doing this now" in quoting Joe Dreliszak. The L-shaped lamp and former boiler house are still said to be standing, though, apparently for other uses. North of Mammoth Park are a few rebuilt ovens, they have been claimed to be destroyed themselves in 2006! How ironic. (sources include 'Westmoreland County Pennsylvania:An Inventory Of Historic Engeneering And Industrial Sites, 1994; America's Industiral Heritage Project, U. S. Dept. Of The Interior, Library Of Congress).